Hawker Henley target tug and dive-bomber. One contemporary publication described the Henley as: "Streamlined, bullet-nosed, with wings rather like the fins of a gigantic fish." Notice the "ribbed" appearance of the rear fuselage due to its structure of fabric stretched over a wooden framework that surrounded the main aluminium structure. This type of construction was already beginning to look old-fashioned when the Henley first flew. However the same structure used on Hawker Hurricanes proved surprisingly strong and stood up to hits from German 20mm Cannon shells better than the monocoque fuselage of the Spitfire, and was much easier to repair. The American Vought SB2U -3 Vindicator monoplane dive-bomber also had a fabric covered rear fuselage. The Hawker Henley is one of the most intriguing "what-ifs" in the history of aviation, yet this is not an aircraft that existed as only a paper exercise, or a partly built prototype, or even a flying prototype that was cancelled. No, this was an aircraft that actually went into production with 200 examples built. This was an aircraft that pilots loved to fly, had an outstanding performance and was both rugged and reliable. So what went wrong? - Why is this aircraft regarded as one of the great "what-ifs"? To try to answer this question you need first to understand the fundamental difference between British air strategy at the start of the Second World War and that of the German Luftwaffe. The R.A.F. was established from the merger of the Army's Royal Flying Corp and the Royal Navy's Royal Naval Air Service as an independent strategic air service. The important word here is strategic. The R.A.F. s principal aim was the destruction of the enemys means of war production. All other uses of air power for tactical purposes were secondary. As far as support for the British Army was concerned it was only felt necessary to provide artillery observation aircraft (the Westland Lysander) and the bare minimum of fighters (a few squadrons of Hawker Hurricanes) to try to shoot down the opposing artillery observation aircraft. Why bomb individual targets on the front line when you could destroy the factories that made the tanks, guns and ammunition? 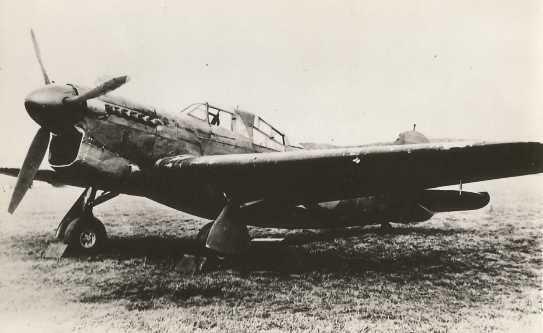 The Germans had exactly the opposite view, the front line at the point of attack (the Germans have a word for it, the "schwerpunkt") was the central focus for air power, with Ju87 Stukas operating in direct support of the army while medium bombers hammered the railways and roads behind the lines to prevent the enemy concentrating to resist the attack. So the very existence of Air Ministry Specification P4/34 calling for a two seat light bomber capable of dive bombing, issued in November 1934, is at first sight surprising and seems to suggest that the there was some move within the Air Ministry to provide a bomber capable of operating at the tactical level. It was this specification that gave rise to the Hawker Henley. Was there really such a fundamental change of policy? The RAF had always had two-seat light bombers in its armoury, the DH4 and DH 9a in WWI and then a whole host of types in the 1920s leading to the outstandingly fast Fairy Fox and then the Hawker Hart and Hind. It should be stressed that these bombers were never expected to operate in direct support of the army in a European war, if they lacked the range to reach the enemys centres of production they were expected to hit the railway networks bringing supplies to the front line, preferably hitting nodal points, marshalling yards and stations as far back from the front line as possible (these were the favoured targets for RAF two-seat bombers in the last year of WWI). So I think Specification P4/34 was probably just a natural next step, an aircraft to replace the Hawker Hinds in Bomber Command's fast day-bomber squadrons. The fact that it included a requirement to dive-bomb is the misleading bit, the RAF seems to have never been seriously interested in true dive-bombing at high angles, it never invested money in research and never developed true dive-bombing sights (unlike the Germans who had fully automatic bomb sights that would even pull the aircraft out of its dive). The lack of dive-brakes and bomb-crutches in the Henley design show that true dive-bombing was never a serious consideration. However, it was stressed for pull-outs from dive-bombing at fairly high angles (up to 70 degrees) and with proper training this could have greatly improved the accuracy of bombing, maybe even doubling or trebling the number of direct hits on target. It is this aspect of dive-bombing, as a "force multiplier" that is often overlooked. The Henley was almost certainly rejected as a bomber because of the existence of the Fairey Battle. The Battle was actually built to an earlier specification (P27/32) based on that of the Wellington twin-engined bomber! In the early 1930s there was a real chance that the international disarmament conference would put a limit on the weight and size of bombers. The Battle was designed to meet the likely limits of such a treaty, so that the RAF would still have a bomber force if the new Wellington, Whitley and Hampden designs were outlawed. The Battle, with its 3 crewmen, was a big aircraft. Go and stand next to the one at the RAF museum in Hendon and you will be amazed just how large it is. I remember as a lad building an Airfix kit of the Battle, putting it down next to my models of Spitfires and Hurricanes and wondering if Airfix had got the scale wrong! It is a testament to the streamlined form of the Battle that a lot of armchair-bound aviation pundits seem to think it was little more than a "stretched" fighter*. It certainly was not. 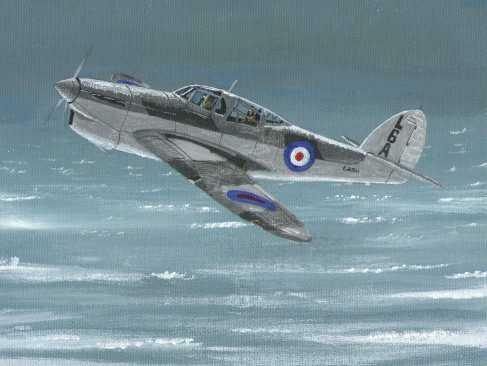 In fact it was the Hawker Henley that could more properly said to be an enlarged fighter - being based on the Hawker Hurricane , sharing the same outer wing design and undercarriage. In construction the Battle, although designed a couple of years before the Henley was much more advanced, being a full stressed-skin design with a monocoque fuselage (Fairey had benefited from close contacts with US aircraft manufacturers who had perfected stressed-skin construction), while the Henley, like the Hurricane, still used a metal latticework covered with wooden frames and fabric to provide a streamlined fuselage. You can imagine the Air Ministry big-wigs, having just signed up to massive orders of Fairey Battles looking at the Hawker Henley and wondering "Do we really need that as well?" The Henley did promise to be faster than the Battle, but its internal bombload was half that of the Battle and its range was slightly shorter. The Battle would be some 70 mph faster than the Hawker Hinds that then formed the R.A.F. 's fast day-bomber force and the extra 30 mph promised by the Henley might have seemed of little consequence. So, when the British sent forces to France in the autumn of 1939 they took large numbers of Fairey Battle bombers with them. It is important to stress again that the Battle squadrons were never meant to operate in support of the Army. They were there as the "Advanced Air Striking Force", an off-shoot of Bomber Command. Their task was to bomb factories , oil storage and strategic communication hubs in the Ruhr region of Germany. The Battles were never used in the strategic role planned for them. This was because the French, fearful of German reprisals, forbade their use against German targets. When the German Blitzkrieg began the Battle crews found themselves flung against German armoured columns and river crossings, targets they had never trained for. The Battles suffered heavy casualties. Would the squadrons have faired better if they had used Hawker Henleys rather than Fairey Battles? - If you are just talking about a straight-forward swop of aircraft without any change in training and tactics then the answer is probably not. As a smaller, faster, more maneuverable machine it would have presented a harder target for German flak and fighters but the result would have probably been that more crews would have survived to complete more sorties - but the end results would have been much the same. Only as part of a complete restructuring of the Advanced Air Striking Force (AASF) and British Expeditionary Force Air Component (BEFAC) into a proper tactical air force with a doctrine for co-operation with the Army , training for identifying and attacking tactical targets, including dive-bombing, could the Henley have stood a chance of success. The underside of the Hawker Henley, showing the bomb-bay which could accommodate two 250 Ib bombs. The two "bobbins"on either side of the fuselage are actually weights fitted when the aircraft was flying without a second crewmember or with the Radio W/T equipment removed to keep the aircraft's centre of gravity correct, a feature common with earlier Hawker aircraft (you can see them still used on the Shuttleworth Collections Hawker Hind and Demon). Having rejected the Henley as a bomber the surprising thing is that it was still ordered into production, but as a target tug. The production Henley was called the Mark III, presumably to distinguish it from the two prototypes (mk I and II). Now the RAF did have an urgent need for a fast target tower; the old biplanes they were using in the role simply did not give a realistic speed for practice by the new generation of fighters, Spitfires and Hurricanes. But it still seems strange use for an aircraft type that was probably the fastest twin-seat bombing design then flying. A production line was established at Hucclecote near Gloucester run by the Gloster aircraft company, then already part of the larger Hawker group, and 200 Henleys were produced.The drogue for towing was wound back by a windmill arrangement that protruded from the side of the fuselage. As a target tower the Henley had shortcomings, it was a bit like using a sports car to tow a caravan, the Merlin engine had to be run at high speed for long periods and so they wore out much more quickly than in normal use. The Henleys neatly faired coolant radiator was exactly the right size and efficiency for normal flying, but when towing a target at high engine speed but lower airspeed the lower flow of air through the radiator was insufficient to keep the engine cool and so overheating would occur. In 1942 The Henley started to be augmented in the fast target towing role by Boulton-Paul Defiants and Miles Martinets. You would have expected the Defiant to suffer from the same engine problems as the Henley, having the same Merlin engine, but the Defiant's big belly bathtub radiator was better able to keep the engine cool. The Henley was not completely replaced until 1945 (the web-link of Henley crashes at the bottom of the page shows continued activity through 1943-44-45 which contradicts the oft-repeated line that the Henley was retired in 1942). Henley K7554, the second prototype, in factory-fresh silver finish, showing the windmill arrangement projecting from the port side of the aircraft. This was used to wind back target drogues. 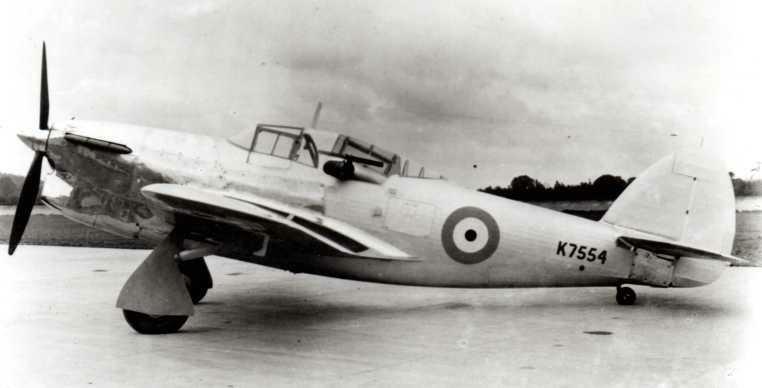 The second prototype Henley K7554 pictured later in "tiger stripes" target tug colours. Note the pull-down step to aid stepping up onto the wing - added after testing of the first prototype at Martlesham Heath had shown that clambering onto the wing with a parachute was a tricky business. The real surprise in the Henley story is why it was not pressed into service during the emergency period of 1940-41. After the Battle squadrons had been torn to shreds over France and the evacuation from Dunkirk it seems incredible that the Henley was not seen as a stop-gap. In this period new squadrons were still being formed on Fairey Battles, the Fleet Air Arm flew dangerous missions to Norway from the Orkney Islands in Skua dive-bombers who's maximum speed was much slower than the cruising speed of the Henley! In East Africa slow Vickers Wellesleys and biplane Fairey Gordons were being used against the Italians. In Malaya and Singapore, even at the end of 1941 the Vickers Vildebeest biplane was being used in a bomber role. All this while some 200 Hawker Henleys were being used as target tugs or stored in maintenance units. In this period the British Air Ministry ordered huge numbers of Brewster Bermuda and Vultee Vengeance dive-bombers from the U.S.A. The Bermuda was an unmitigated failure that cost the UK taxpayers millions of pounds (the contracts were signed before lease-lend came into force and the U.S.A. insisted on payment and delivery of the aircraft which just cluttered up maintenance units). The Vengeance did prove itself a good dive-bomber but only after considerable development problems were overcome. It seems incredible that the Henley was not utilised during this period. It would have needed armour protection for the crew added and self-sealing linings fitted to the fuel tanks to make it fit for combat, and these additions would have taken away something from the performance. But even with 10-15 mph lopped off the top speed it would still have out-performed the Vengeance in all but bomb load, and even that might have been equalled with the more powerful Merlins available later in the war. The Henley performed valuable service as an engine test-bed, The prototype K5115 was fitted with a Rolls Royce Vulture engine, as was L3302. Henley L314 served as a test-bed for the Rolls Royce Griffon. Above and below: Henley L3414 was used for testing of the powerful Rolls Royce Griffon engine, used on late marks of the Spitfire, the Fairy Firefly and Lincoln bomber. Note the big chin radiator and the modified rear canopy for the technician(s) monitoring the engine test instrumentation. It still looks an elegent aeroplane. One can only guess at the performance of a production version of the Henley fitted with a Griffon or late model Merlin engine. One would expect it to be well above 300 mph. Henley K5115 (see above) was used to test the Rolls Royce Vulture engine, as used on the Avro Manchester and Blackburn B20. Rather than the chin radiator of the Griffon installation it used a ventral "belly" radiator like the Hurricane, although in this view you are reminded strongly of the P-51 Mustang. The Gloster aircraft factory at Hucclecote that produced the Henley easily switched to producing Hurricanes in the Battle-of-Britain period and made a valuable contribution to the continuing supply of these much-needed fighters. Of course the Hurricane then went on to be widely used as a fighter-bombers, often carrying bomb-loads equal to the Henley. After the Hurricane the factory then produced the Typhoon, the outstanding fighter-bomber backbone of the British Tactical air Forces in the allied invasion of Europe. The prototype Hawker Henley K5115 first flew on 10th March 1937 from the famous Brooklands aerodrome. As originally constructed it had one of the early trial Merlin "F" engines and fabric covered outer wing sections like the early Hurricanes. It was later re-engined with a production Merlin I engine and given fully stressed-skin metal wings. The second Henley prototype K7554 was completed as a target tug with a Merlin II engine and first flew on 26th May 1938. The first Henley Prototype arrived for tested by the Aeroplane and Armament Experimental Establishment (AAEE) at Martlesham Heath on January 10th 1938. This testing did show up some problems with access and control . The most major problem seems to have been forward visibility through the curved front canopy used on the prototype, which was easily obsured by rain or oil. Most of these problems seem to have been cured on production aircraft. The top speed in level flight noted for this prototype was 292 mph at 17,100 ft., while it was dived up to 395 mph . Another production target-tug Henley was also tested late the same year and that was dived to 450 mph and pulled out at 6.4g without any structural damage. The Henley was a streamlined mid-wing monoplane, the mid-wing arrangement allowed the Henley to have a small bomb-bay that could accommodate two 250 -lb bombs side-by-side. There was provision for the rear gunner to adopt a prone position to use a bomb-sight in the floor of the aircraft for level-bombing (it seems to me from the cut-away drawings available that the "window" through which the bomb-sight operated was only uncovered when the bomb-bay doors were opened). While operating the bomb-sight the aircraft would be vulnerable from attack from behind while the gunner was out of reach of his gun. In the bomber version this rearward firing gun would have been a .303 Lewis or Vickers "K" gun. The Henley was stressed for dive-bombing at angles up to 70 degrees, but there is no evidence of any arrangement for throwing the bombs in the bomb-bay clear of the propeller disk when dive bombing at high angles (most dive-bombers used a bomb "crutch" to swing the bomb away from the fuselage on release). There was provision in the original bomber design for a single browning .303 machine gun mounted in one of the wings to fire forward, but because the outer wings were essentially the same as those used on Hurricane fighters there would probably have been little trouble in increasing it up to the full compliment of eight machine guns if so required. In 1942 a Henley (L3276) was tested at Boscombe Down with two 500 lb bombs, one under each wing, and also two "light series" bomb carriers, again one under each wing, providing a total bomb load of 1,160 lb. "In many respects the Henley is an example of a highly efficient and promising aeroplane wasted." "- I still think we could have done with a few Henley Squadrons." " I trailed through the skies cursing them, my C.O. and all the lunatics who had relegated a war-worthy fighter to target-towing." - Sqdn Ldr D.H. Clarke D.F.C. A.F.C. -"What Were They Like to Fly"
Maximum speed (bomber configuration) at least 292 mph . Target tug: 270 mph when towing sleeve target. 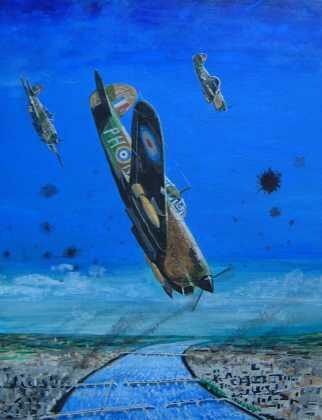 My painting of how Henleys might have appeared in the true dive-bombing role - in this case over the bridges at Maastricht. 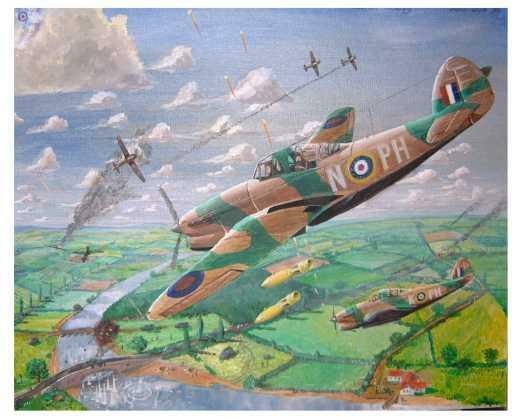 This painting featured in Peter C. Smiths book "The History of Dive Bombing" (Pen and Sword 2007 edition). Another painting of mine showing Henleys might have looked attacking a German motorised column in France in 1940. This is my attempt at a Hawker Henley in desert camouflage colours circa 1942. 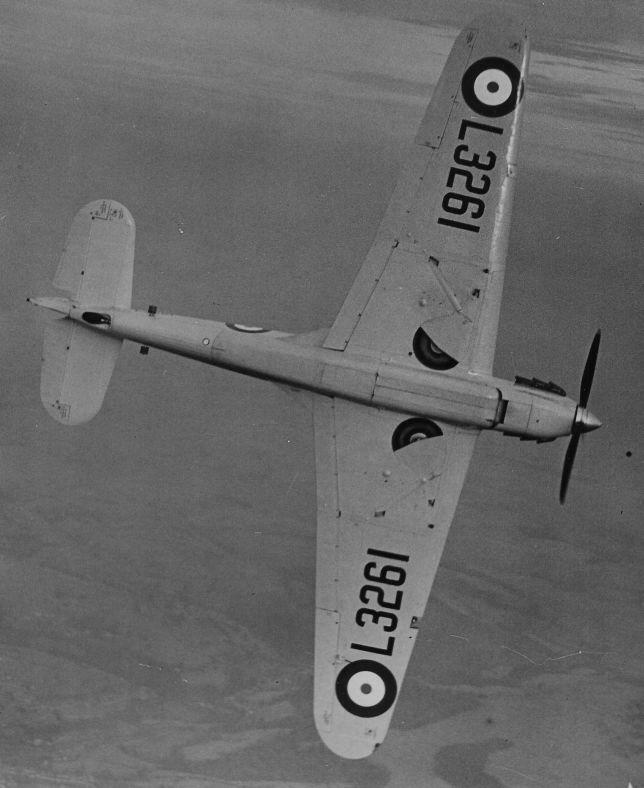 The Henley might have been a very handy aircraft to have around in the Western Desert, which is where the RAF at last got to grips with the task of supporting the Army and developed the tactics later used in Italy and then France after D-day, including the formation of Tactical Air Forces (TAF). A mid war (1942-43) Henley could have benefited from the increased power of the later Merlin engines, giving increased performance. Hawker Henley painted as it might have appeared in Fleet Air Arm service early 1940. The Henley actually did serve in the FAA in the target tug role and some were supposedly on the airfield at Hatston in the Orkney Islands (with 771 Squadron) when Blackburn Skua dive-bombers took off from there to attack and sink the German Cruiser Königsberg anchored in Bergen harbour. The Skuas were operating at the limit of their range. The Henley had a range of 940 miles compared to the Skuas 760 miles, it could carry (potentially) twice the weight of bombs and its cruising speed was higher than the Skuas maximum speed! The FAA operated Skuas out of Hatston against targets in Noway for much of 1940. One certainly wonders why the Henley was not used in this role instead. * Len Deighton in his book "Blitzkrieg - From the Rise of Hitler to the Fall of Dunkirk" makes just such a misleading assertion. ** To see an article on "Taffy Jones" on the BBC website that mentions this incident <click here>. "Probe Probare" Part 16 by Alec Lumsden and Terry Heffernan in the September 1985 Edition of Aeroplane Monthly Magazine. 5 Pages with numerous photographs covers the testing of the Henley by AAEE at Martlesham Heath and Boscombe Down. "What Were They Like to Fly" by Sqdn Ldr D.H. Clarke , Chapter 15 "Condemned at Birth!" Covers the Henley (only 2 1/2 pages). Published by Ian Allan 1964. "The Hawker Henley" by Thurstan James in the March 1st 1939 edition of "The Aeroplane" magazine is a 4 page article which includes a cutaway drawing and diagrams of the Henley's structure. This article was reprinted in the July 1989 (Issue 2) of "War in the Air" magazine.